For the third time in a month, utility customers in Bend, Oregon suffered temporary power outages thanks to animals. Back on June 26, more than 5,000 customers were without power for more than two hours after a bird pecked a hole in a transformer housing causing a short in the system. That outage trapped a Doubletree Hotel guest in an elevator and required firefighters to rescue him through a door in the elevator’s ceiling. A few weeks later, another bird caused an outage for some 10,000 customers when it flew into a transmission line. Central Electric Cooperative says it tries to discourage birds from getting into equipment by installing mock nesting platforms around them, but it isn’t always successful. 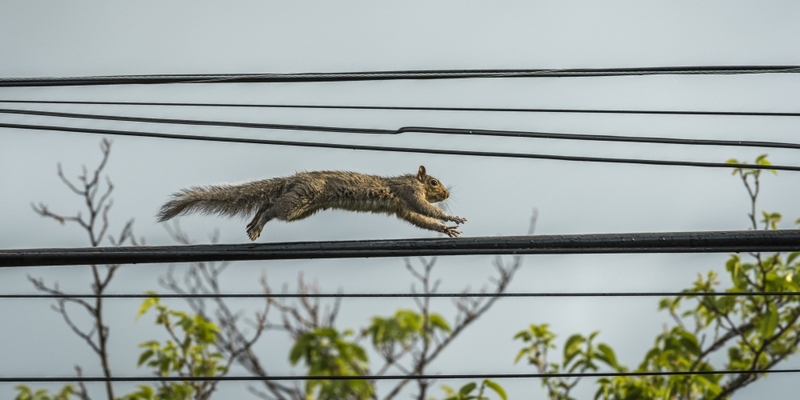 Then, yesterday, a squirrel got into a substation causing an outage impacting almost 5,000 customers. While none of the outages was notably long, any outage is an inconvenience to both residential and business customers. But, these three instances are only part of a seemingly growing trend of wildlife getting coming into contact with utility equipment and causing outages. For businesses, this poses a double threat. Not only do they leave many businesses without operational capacity, the even bigger risk is permanent damage to equipment from surges that typically accompany outages at the time of failure and restoration. Whether large or small, every business should be aware of the potential damage from power surges, but also that power protection and backup systems can eliminate that risk. One of the items every CTO, COO, and IT manager should have on their checklists should be a budget line item for installing a properly sized power protection system. While it’s an additional expense at a time when budget dollars are in high demand, these systems ensure sensitive equipment is not damaged by surges. For shorter outage, such as the recent once in Bend, UPS systems can support continued operations while power is being restored.